It was the 9th Earl (1752-1826), George Finch, Earl of Winchilsea who created the present Llandanwg harbour entrance in 1819 [see Shell Island ]. It was formed by the diversion of the Artro by the Earl of Winchilsea in 1819 to improve access to the wharf at Pensarn which was the shipment point for slate from Llanfair and Llanbedr. Prior to this the Artro entered the sea to the south of Mochras. The Shell Island, also known as Mochras, is a peninsula lying west of Llanbedr in Gwynedd, Wales, which was formed after the River Artro was diverted by the Earl of Winchilsea in 1819 from its previous course where it entered the sea to the south. To the northeast of the new bar (Bar Newydd) the entrance to the Arto has been constricted by a breakwater linking to Llanbedr and Pensarn Yacht Club. This structure was introduced to increase draft in the river basin nearby and within the outlet channel. 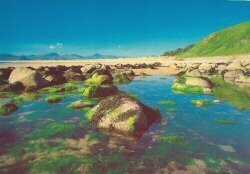 It has had an adverse impact upon the shoreline to the north east towards Llandanwg promontory. The vertical profile of the breakwater and its location relative to tide levels suggest that energies are redirected now on to the dune frontage leading to Llandanwg Point. [See Structures and Defences, Pye and Saye (2005) ]. 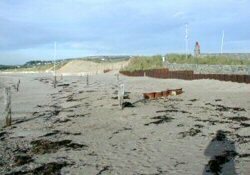 To counteract this groynes were established on the beach to minimise wave deflection along the beach from the breakwater. The groynes are now derelict. 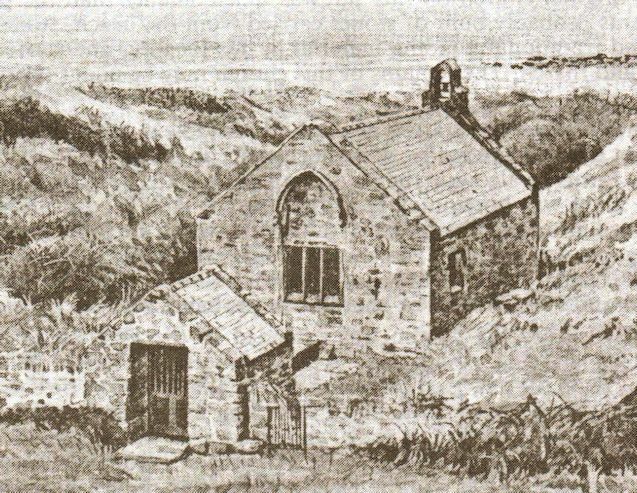 In the sand dunes is an ancient church dedicated to St. Tanwg, who may have founded it. Tanwg is placed by legend in the 5th Century at a time when the Roman Empire in Western Europe was disintegrating. It may have been founded around 435 AD as part of St. Patrick's communication system between Ireland and Britain. St. Patrick was a Briton. He was consecrated Bishop before being sent to Ireland in 432 AD by the British Church. Well attended services are held at the church in the dunes during the summer and at major christian festivals. Local residents were, and still are, concerned about the clearly visible shrinkage of the dunes, which are a vitally important barrier to the sea. If the dunes are penetrated or lost then this will result in some flooding for the local Yacht Club, Llandanwg church, Llanbedr airfield and the Christian Mountain Centre at Pensarn. Arguably, a sewage farm, the Cambrian coast railway line, various dwellings and hundreds of acres of farmland in the Artro valley are also threatened. Mochras Lagoon could be lost as an anchorage for small craft. The boat house at the end of the dunes is threatened, and the dunes as a visual and environmental amenity are in danger of disappearing. By the end of 2002 about two feet, in depth, of sand had been removed from the beach in front of the dunes, and in two places, over a length of about 60 yards each, the width of the dunes had been reduced by half. At that rate of erosion, if nothing was done, the dunes would have been breached some time during 2003. The Llandanwg Dunes Protection Group was established 7th March 2002 and, fortunately, during 2003 much was accomplished. Now we wish to move on to preserve and improve on what we have already achieved.